….. was the start of The Beerded Lady Bottle Shop in early summer of 2014. Owners Antares Nicklow and Shannon Cummings are no strangers to the ways of beer and have been avid homebrewers for 6 years on top of experiencing great specialty beers both here and abroad. 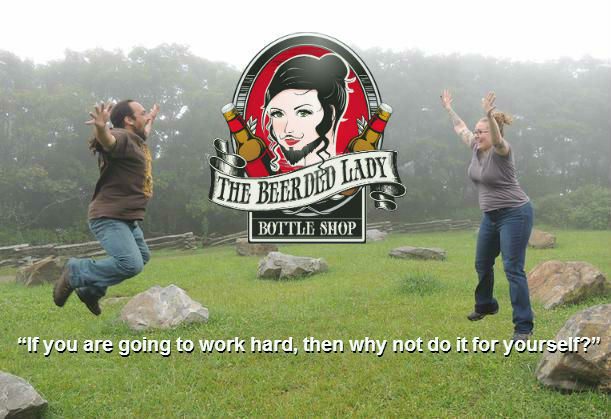 The Beerded Lady is our labor of love, and we want to share it with the growing town of Garner. People expect more from their drinking experience these days, and we are more than happy to have the opportunity to provide that to our customers! We will bring in a great selection of brews ranging from some of the best go-to craft beers all the way to some of the most exotics we are able to obtain that bring a palate opening experience to some of even the most veteran enthusiasts. As IPA lovers (not a trend for you nay-sayers), you can bet we’ll have some of the best ones around! Malt beverages are our specialty, but that doesn’t mean we don’t cater to those that have gluten allergies or (God forbid) just don’t like beer! We will carry a unique selection of wines, ciders and meads that can’t be found on a grocery store shelf. We do this because we love beer, and we know there are others that do too. Look forward to seeing you!